I've been wanting to go to Project Shaw for almost 2 years - really since after Deuce closed and I was wondering what Marian Seldes was up to. Either I was already booked for something or I didn't act quickly for this monthly event. But I can finally go tonight and and lo and behold, Kate Baldwin AND Michael Cerveris are performing! Kismet! *Update* Project Shaw was a lot of fun. It was a simple reading only. The "cast" only has one opportunity to read through before before they read before the audience. I would never have guessed that because Michael Cerveris, Kate Baldwin, Bradford Cover and David Marguilis were so fun to watch. The Players Club is charming and full of history so it was a bonus in going down to Gramercy Park. The only problem was that the room was HOT and the audience was VERY CRAMMED into the room. However, I'd love to go again. 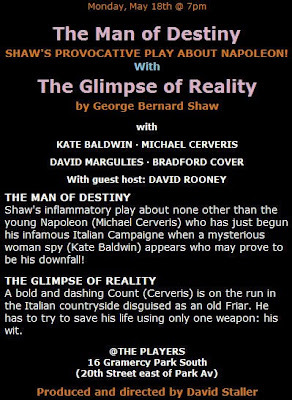 The best thing about it is that if you're a fan of Shaw, it's an opportunity to hear his work that is rarely or never performed.